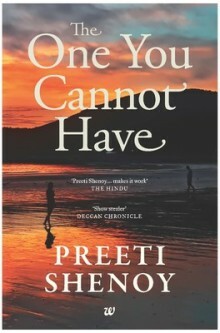 I had previously read all of the books from Preeti Shenoy and had loved it. Hence when this book came out, I was very eager to buy it. But the theme of ‘unrequited love’ and ‘moving on’ did not appeal to me. Two weeks ago, when I ordered few easy-read books for inspiration, I ended up buying this book. How long does it take to heal a broken heart? Can you ever forget that one perfect relationship you had? Anjali knows who she wants, she wants Aman. Aman too knows who he wants, he wants Shruti. Shruti and Aman were once inseparable. Theirs was a love that would last forever and more. Then, out of the blue, Shruti left Aman. A devastated Aman moved abroad in the hope of forgetting Shruti and to heal. Shruti married Rishabh. Now Aman is back in India and looking for a fresh start. But he is still haunted by memories of his love. Can he ever break free from it? His head tells him to move on, to find love with Anjali, but his heart wont listen. No matter what he does, Shruti’s shadow looms large. Can there be a happily-ever-after for any of them? A straight-from-the-heart modern-day romance of unrequited love, of complicated relationships and about moving on when you realise that there will always be the one you cannot have. The cover page looked impressive, but the title was not. In fact, it was the title and the blurb which made me not buy it, the instant the book came out to the stores. I had my own view in these matters of relationships, and the way the author handled past relationships in other books, did not go well with me. I could identify and recognize the feelings which is truthfully portrayed. More than the break ups, what enthused me is the situations which every newly married and working woman will face, like making the marriage work and adjusting with the in-laws which are beautifully described. The language was simple and straightforward, which is why I like her writing style. The book is very much contemporary with the mentions of Facebook and Instant Messenger, emails and SMS being integral part of the lives. It was more of a hero-centric book, and hence the work descriptions, start and the ending is told through the perspective of the main guy character, Aman. The story unfolds through narrative of several characters. Each chapter has a different character telling the story, which is quite hard for the reader (or me!) to digest, as they need to change into different mindsets at the start of every chapter. Some may see it as a refreshing change and may also like it, but it didn’t impress me much. The strong bonding with the characters never happened. I would have preferred a single character portraying the whole story, or from a third person point of view. The additional overdose of trendy hobbies like organic farming, gardening and content writing which is evident from the interests of the author is also incorporated into the book. I somehow, missed the charm of old ways of story telling, and felt like reading a novella or long blog post. It could also depend on the mood you read it through. The book is mainly about moving on. Hence it may relate to the younger crop who has more chances of facing the heartbreaks and finding hard to move on, or being forced into arranged marriage. I would rate this book 2.5/5. Linking in to Wednesday Prompt at Write Tribe. Well the blurb sounds interesting but switching between different character’s mindset seems to be a put down! Nibha recently posted…Paint It Black!!!! With your rating of 2.5 this book won’t make it to my reading list. Thanks for sharing.